Industrial PC Enclosures for computer protection against dust, dirt, liquids, theft and vandalism. This page should answer some of the questions that we are most commonly asked about Industrial pc's. If there are any questions that are not answered here please feel free to Contact PC Guard and we will get back to you with a reply as soon as possible. Answer: Maintenance on a bespoke industrial PC may be difficult to obtain. In many cases only the supplier can provide the support. Any computer maintenance company will be able to give you cover of a standard PC in a PC Enclosure. What country will the product be used in? Protect PC's in an hostile environment with a Computer Enclosures they make your desktop into a rugged PC using a computer cabinet made of steel.Our pc enclosures are made of steel with a filtered air supply as are all our protective computer enclosures . Computer dust protection is essential to ensure reliable operation in hostile environments. 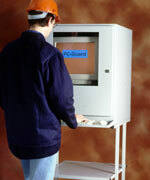 In addition computer physical security is assured by the steel case of the PC-Guard computer protection enclosure . Yeong Yang Technology Co. Manufacturer of professional computer cases. Zero Corporation Protector of electronics, systems packaging, thermal management and engineered case requirements of the telecommunications, instrumentation and data processing markets. Armagard Manufacturer of PC protection and enclosures. Antec Manufacturer of computer cases, power supplies, and peripherals. Amtrade Products Supplier source of PC computer chassis including new ATX tower system cases, high end network file server enclosure, and industrial rack mount chassis.